"Sandy is the best massage therapist in the world! I had a 30 minutes chair massage, and got such relief, like no other massage that I've ever had before." "With my busy schedule, I don't have a spare second. Sandy has a way, with her chair massage, to unravel the knots in my neck and shoulders and help me feel so ready for the rest of my week. Thank you, thank you Sandy!" Sandy is passionate about using massage to relieve pain and build health. She started her career over 20 years ago as a certified reflexologist in the Chicago area. She has spent two decades building on that foundation, becoming expert in deep tissue, trigger point massage for the entire body. Sandy takes the best of all the modalities she's studied over the years to create a massage that targets each muscle as effectively as possible. Some of her techniques include therapeutic, assisted stretching, as well as using hot stones as tools to access and release deeply embedded muscle restrictions that can't be effectively treated with hands alone. 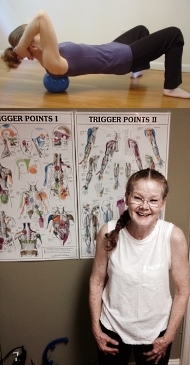 Using her techniques, Sandy has had excellent results when treating plantar fasciitis, carpal tunnel syndrome, rotator cuff injuries, low back pain, chronic neck and shoulder restrictions, as well as a host of other painful conditions. Sandy is also committed to educating her clients in the ways they can use self-massage to promote and maintain their own healing. At-home exercises can include ball rolling, therapeutic stretching, and foam roller techniques. Many of Sandy's athlete clients find the self-massage to be an excellent addition to their training programs. Sandy believes that with the right knowledge and tools, her clients can lead healthier, more active, and more fulfilling lives.